Let's be frank. The air hovering above Salt Lake City is a mess, at the moment (at least that much is clear). Each year, we come to expect a thick cloud of muck to descend upon our city, and we fear that we Salt Lakers may be lulling into a sense of acceptance. This, we proclaim COLLECTIVELY, cannot stand. And the folks at PechaKucha agree. PechaKucha Vol. 19 is right around the corner, and, in the interest of doubling-up on impact, they're teaming up with the 4th Annual Utah Clean Air Fair, held this January 28th at Trolley Square. That's all the goods in 20 slides for 20 seconds, plus loads of other events and activities planned to foster "fresh ideas for fresh air". 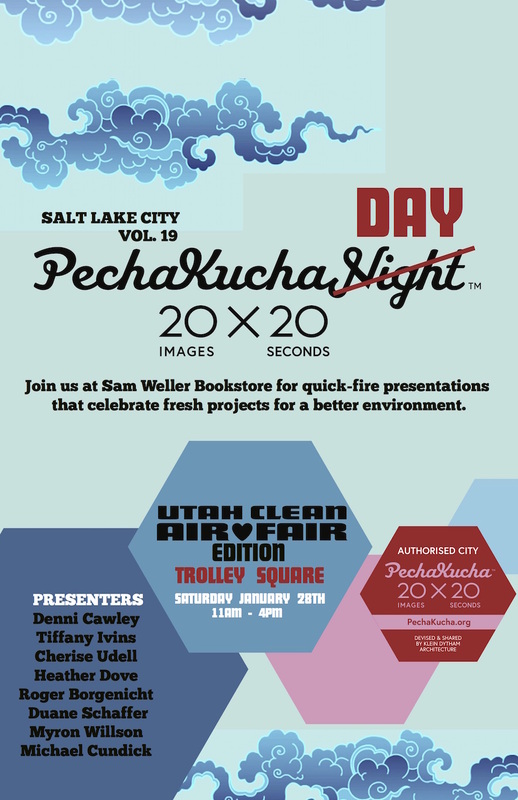 For the full list of what goodness to expect, visit the PechaKucha Night event page, and be sure to ride your bike, if weather permits (see: extra karma points and a bike valet by the SLC Bicycle Collective!). Folks, the weather outside is frightful. It's time we did something about it. COLLECTIVELY.